In teaching, there is a pedagogical move away from the traditional “sage on a stage” method of lecturing to a group of passively listening students to more active, small group-based techniques. These methods often rely on the classroom being able to transition between a lecture task to a group activity format that moves the instructor to a “guide on the side” position where they provide a coaching role for the students. Group activities engage with the students through smaller group interaction and promote collaboration skills that are vital for today’s workplace. There are a variety of means to achieve this manner of flexibility in the classroom. In general, the formal “front” of the classroom is eschewed in favor of a more active pedagogy. One method is to arrange the classroom into a series clusters, grouping the students into teams of 2-8. This allows the clusters to be grouped with whiteboards, display monitors, and other tools to facilitate the group activity. Another approach is through the use of movable tables and chairs that allow the layout to be quickly reconfigured from lecture to group format during class. 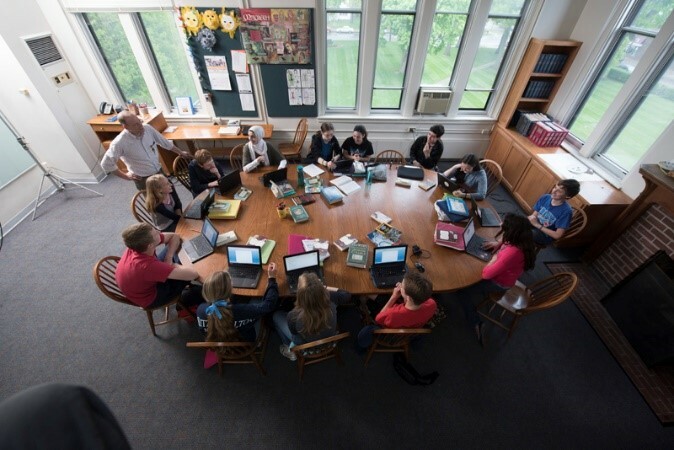 For smaller class sizes (8-14 students), a third method involves the use of a Harkness table in the center of the room with technology and whiteboards on the surrounding walls. This approach, named after Edward Harkness who developed the pedagogy at Phillips Exeter Academy, is effective in discursive teaching formats. The collaborative environment fostered by active learning is not limited by the walls of the classroom. It’s not necessary for these spaces to be expressly programmed. Informal meetings and spontaneous exchanges can be fostered at gathering and crossing points within the building. Shared amenity spaces such as lounges, break rooms, and commons are popular venues for this type of interaction, but other areas can be designed with collaboration in mind. Corridors, connecting major programmatic elements, should be wider or provide seating areas and alcoves to allow for small groups to gather without interference from passersby. A grand stairway encourages conversation when it is wide enough for two to walk abreast on it. Outside of the classroom, it is of critical importance that collaborative spaces be informal and in proximity to the classrooms, faculty offices, and each other. 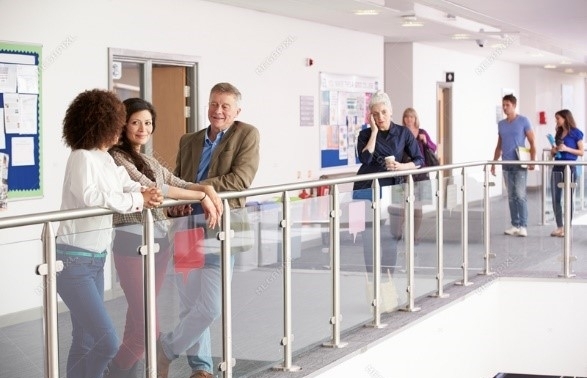 Providing a mixture of spaces with varying degrees of privacy is necessary to serve a variety of one-on-one, peer, small group, large group, or student-faculty interactions. Traditional meeting rooms are less valued due to their formality, and the necessities of scheduling. In contrast, small break out rooms located outside of classrooms and along corridors and lobbies offer greater privacy in a casual setting. A break out room ideally accommodates 6-8 around a table and provides the requisite video display and writing surfaces. Glass partitions serve to make the break out room more visually open and accessible while controlling the acoustics, conveying whether the space is available and sharing the activity within. A focus on the connective areas between the major programmatic spaces also synergizes with active design principles by encouraging more movement through the building. These principles are detailed by the Fitwel certification system, established by the Center for Active Design, and focus upon increasing physical activity to support health. In addition, an innovation credit can be achieved in the U.S. Green Building Council’s LEED certification program by designing for active occupants. Not only can a staircase be designed to encourage travel upon it by groups, but it can also serve as the principal means of vertical travel in the building and a significant wayfinding tool. Likewise, shared amenity spaces desire proximity to the classrooms and offices but should be placed to encourage some travel to them thereby supporting wellness and fostering opportunities for faculty and student collaboration. The nature of work has changed significantly in the past twenty years, with greater emphasis placed upon social skills, teamwork, and the ability to quickly analyze information. Higher education is a competitive field, and institutions are striving to increase the attraction and retention of new students, as well as provide an education that will prepare them for the needs of the modern workplace. Ensuring that their facilities support new active learning pedagogies is key to providing a quality education relevant to today’s information age. Adler, Paul, et al. “Building a Collaborative Enterprise.” Harvard Business Review, 15 July 2011, hbr.org/2011/07/building-a-collaborative-enterprise. Sean Foley is a project architect at PS&S. He has 20 years of experience focused in higher education design and campus planning. He holds a bachelor’s degree in architecture from Syracuse University.